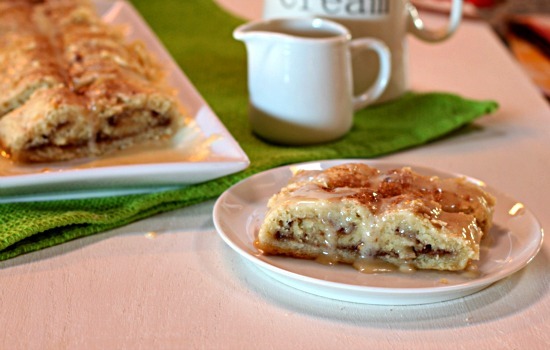 The perfect Gluten-Free Kringle Recipe for your Christmas Brunch! I mean it. A Kringle is a hand-rolled Danish pastry dough that is then shaped, filled, baked, and finally… iced. Every year, my in-laws receive a delectable Kringle from some of our family friends. And every year no one in my immediate family can eat that gluten-filled treat. They just watch and drool as the rest of the non-gluten free members of our extended family devour the delicate Danish Pastry. This year, I had an “Aha” moment. 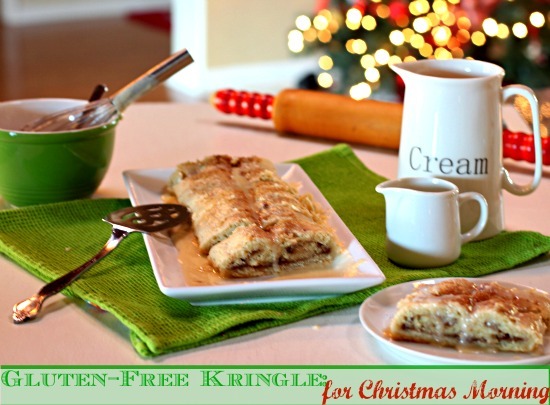 I could not think of why on earth I could not make my own gluten-free version of a Kringle. So. Guess what? I did. And the results literally shocked me. This thing is amazing. I have never seen my boys or my husband…or even my non-gluten-free father-in-law…love something so much. There was not a crumb left the first time I made this…or the next, or even the next four times I whipped it up again. The dough only takes 5 minutes to put together. It is so stinking easy. Simply toss the ingredients together, then throw the dough in the fridge to firm up for about one hour…while the kiddos are opening the presents perhaps. Roll out that dough and spread on that yummy filling. Roll it up. Throw it on your baking sheet and into the oven. Whisk up a quick icing right when it comes out and you have yourself a beautiful Gluten-Free Kringle Pastry for your Christmas brunch. And by the way, this is all decadence and should not be confused with a healthy breakfast dish. 😉 The Holidays are a time for a little splurging, right? 1. In a medium mixing bowl, add flour blend, butter, sugar, and salt. Using pastry cutter or two forks or your hands, blend together until mixture is crumbly. In separate bowl, mix together yeast, beaten egg, and milk. Add milk mixture to dry mixture. Continue to mix until blended. Dough may seem sticky. Do not worry. Take dough and place on large piece of plastic wrap (at least 11 x 17 inches big). Flatten dough into a disc and wrap it in the plastic wrap. Refrigerate for 1 hour (or longer). 2. When dough is ready, preheat oven to 350 degrees. In small bowl, mix together sugar and cinnamon. Melt butter and set aside. Remove dough from refrigerator and open plastic wrap. Leaving dough in center of wrap, take a second similar sized piece of plastic wrap and lay it on top of the dough disc. Using a rolling pin, roll dough out into a 1/8 inch thick and 11 x 17 inch rectangle. 3. Brush the dough with 3 Tbsp butter and then cover evenly with the cinnamon sugar mixture, reserving a couple of teaspoons of sugar mixture. Rolling from the long ends of each side, roll each side towards the center until both sides meet. Roll the assembled kringle off of the plastic wrap onto ungreased cookie sheet. It really does not matter if you place it face up or face down. Brush dough with remaining 1 Tbsp butter and sprinkle with remaining sugar mixture. 4. Bake 20-25 minutes, until slightly firm to touch. Remove from oven and let sit for 10 minutes while making glaze. To make glaze, simply whisk together powdered sugar, butter, milk, water, and vanilla until smooth. Top Kringle with glaze and serve. This is nothing short of amazing Kim! Absolutely beautiful and I’m sure incredibly delicious! Happy Holidays my friend! Ah..thanks so much, Sarena. This is definitely a naughty treat, but so yummy. 😉 Happy Holidays to you too, my friend!! Is this recipe similar to your families’ recipe? This is similar to one that is enjoyed by my family. I developed a gf version, too. Hi Pamela! This is pretty similar to our family recipe and the one’s our friends use too. I had to make a few tweaks but kept the ratios pretty similar to theirs. I would love to see your recipe too! Is it on your blog? I adore pastries! I’d be curious which flours YOU used, and also if you think I could get away with an egg replacer…..pastries have their own opinions in my experience! I’s like to try this xmas morn, let me know dear Kim!! Hi Tessa, so I tried this with three different flours. Pamela’s baking and pancake mix, Pamela’s artisan mix, and then the Pure Pantry mix. All three worked great. But, it turned out THE BEST and completely like the Danish we were used to with the Pamela’s baking and pancake mix in flavor, but the dough was really sticky to work with. When I used Pamela’s new artisan mix, the dough was much better to work with (more like a gluten dough), but it tasted a bit more doughy. I think I needed to roll the dough out thinner perhaps to make it less doughy. The Pure Pantry mix worked a lot like the Pamela’s Pancake mix, but I liked the flavor better with the Pamelas. I think for Christmas morning I am going to use Pamela’s baking mix again. I have not tried the dough without eggs yet so I did not add an egg-free option. I would love to hear if you do and how it works out!! 🙂 Happy Holidays, Tessa! Hope your season has been amazing so far! Kim – this looks sensational! What a great brunch idea for ANY time of the year! Heavenly Kim! You are the most amazing wife and mom ever! I have made it without adding the frosting the night before. Then you can heat it to warm it and then add frosting or icing and serve. I am making it today for our family Christmas tomorrow. Actually, my family doesn’t need it heated. They gobble it up. I have even frozen it and added frosting later. I don’t have it up on my blog yet. And I’m recovering slowly from shingles so it might be a while till it gets there. But i will post it. I’m a grandmother and have been having Kringle shipped in for Christmas since I was a young girl. We wondered what we’d do this Christmas with two grandsons who don’t eat gluten and casein. You’ve saved the day; God bless you! And I may stop ordering Kringle for the rest of us. I want to try different kinds of fillings. Hi Carolyn! I am SO happy to hear that you are going to be able to use this recipe for your grandsons! We are in love with this one and my boys now also request it for their birthday “breakfasts” as well! It is really so easy to put together… I hope your family enjoys it! Happy Holidays! I did terrible with this recipe! The dough was so sticky I couldn’t manipulate it at all. I so badly wanted it to turn out, but it was a disaster. Even after it looked awful, i cooked it anyways, to see if it would taste good. It was crumbly dry. My first try at gluten-free cooking. I wish I knew what I did wrong. Hi Tracy! I am so sorry the recipe did not work out for you. So.. let’s try and trouble-shoot for you. I have made this one about 15 times now and there are some tricks that may help you get better results. First, gluten free dough will always be sticky, no matter what…it is just the nature of the gluten-free beast unfortunately. The dough will never seem like it is right and you will always question it. BUT, I have found that when I combine Pamela’s Pancake and Baking mix flour WITH Pamela’s Artisinal Flour mix (about half and half) the dough is far far easier to work with. Also, keeping your hands really oiled and the saran wrap really really oiled makes it far easier to work with as well. Can you tell me what flour blend you used by any chance? I have a feeling that if it turned out dry, what happened was that because it was so sticky, it was probably really hard to get the dough even all the way through the roll so some areas were likely really thin and probably cooked too fast. This happened on one of my attempts in the beginning when I used a flour blend that was too difficult to work with. This was an ambitious recipe to try out for your first attempt at gluten free baking… 😉 Kudos to you for giving it a go! But I promise if you give it a go again and change up a few things you will love this recipe. Thanks for reporting back! Is there a way to print the recipe – only? I don’t need all the comments & lead-ins. Kim, this recipe is my introduction to your website, and I have to say I’m impressed. I just took my first bite and I am blown away by how good this is. I am Danish and have tasted many a kringle in my lifetime, but never a gluten free kringle, and although this is different from the “real” thing, it’s as close as you can get. I used cardamom instead of cinnamon, added some marzipan to the filling, and it’s divine. Can’t wait to try it with cinnamon, perhaps next week, if I can hold off that long! Thank you so much, you made my day! Just two years ago I made my first Swedish Kringle & it was wonderful but now I am trying to be G.F. I tried this recipe this morning & it turned out to be quite a surprise for me, I really enjoyed the texture & flavor. I will be making this for many people this Christmas .I am quite sure they will like it as well & be surprised. I had already had a batch of Jules G.F. baking mix made up so I used it because I like the results I get when I use it. It is relatively simple & quick.